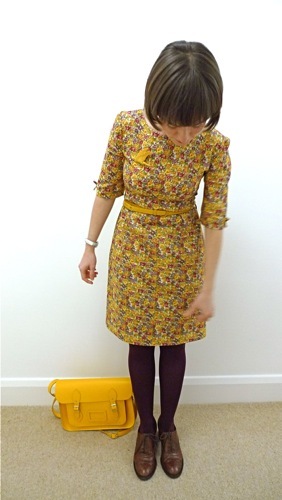 Tilly and the Buttons: Look, I made a dress! Look, I made a dress! So... the idea behind this blog is to track my progress (or not) in the world of sewing, starting from the position of a complete beginner. I've always loved clothes from the 1920s to the 1960s but don't have the patience to trawl through overpriced vintage clothes shops in the hope of finding a non-putrid gem that vaguely fits me. I've recently become sucked into the world of fashion blogs, developing friendship crushes on American "thrifters" (that means charity shoppers in English, I do believe) and finding inspiration in their words and pictures. 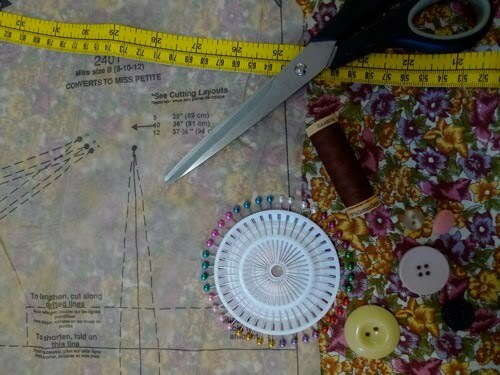 From there, I stumbled upon images of vintage dress patterns which made me drool all over my keyboard (not literally, that would be hideous) and gave me the itch to start making my own frocks. I'd never learned to sew before as I started secondary school at the same time as a new feminist headmistress who replaced home economics with IT (which is a good thing, obviously). 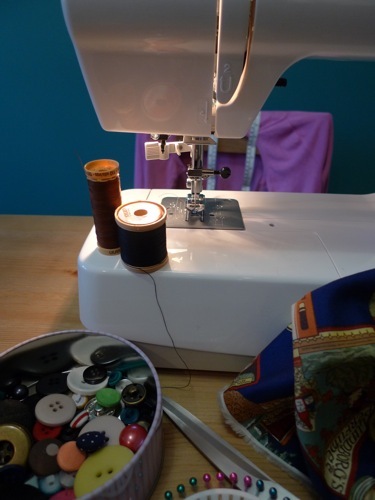 And while my mum went to fashion college and often took me to the Victoria & Albert Museum to draw the dresses when I was a little girl, the sewing machine always seemed to be a boring Sunday night trouser altering machine rather than something I could get to grips with and learn to love. Anyway, I decided to give it a go and got a sewing machine from my mum for Chrimbletide and spent the last few days on an intensive Introduction to Dressmaking course at Oh Sew in Brixton. 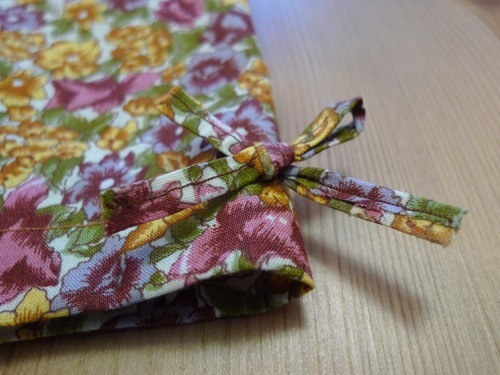 For my first project, I used Easy McCalls pattern M2401 with fabric sourced from Cloth House on Berwick Street. It's very near my office, so I imagine I will spend many a lunchtime ogling pretty prints. In spite of such disasters as wonky darts, pin-shredded fingers and nearly sewing my armpits up, I loved it. 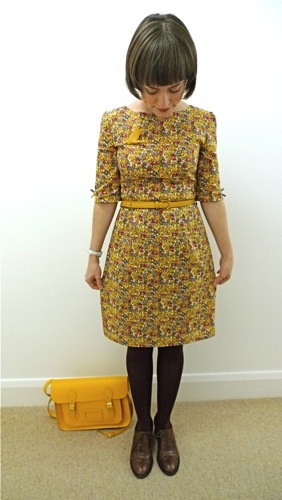 And here she is, my first ever homemade dress! I couldn't resist adding some little bows to the sleeves, inspired by Sarai of Colette Patterns.